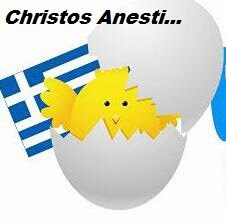 Christos Anesti. Christians throughout the world celebrate the Resurrection of Christ. In the Orthodox world the day is marked by midnight mass which takes place later on tonight, so from Athens, to Moscow, Bucharest, Sofia, Belgrade, Nicosia the Ukraine and other countries families gather together to mark the event. Easter is without a doubt a more important day than Christmas to Orthodoxy. The Patriarch of Constantinople will be issuing his annual circular tomorrow which I am hoping will contain information about progress made to achieve unification with the Catholic church. The 'talks' have been going on since 1250 so about time the division stops. I find it astonishing as to why there is a split given that there is no theological disagreement between the Orthodox and Catholic church and as some Archbishop pointed out a few months ago the division took place (political reasons) in 1100 meaning that there was only one church before that? Anyway am not religious but the split is stupid! In the meantime the main news in Hellas is dominated by a statement made by Theo Pangalos, Deputy PM, who has issued warnings to PASOK ministers warning them that they need to do better. Conservative party ND (New Democracy) have been critical about the way PM Papandreou has handled the financial crisis. They forget, of course, that they were in government 5 years before the economic time bomb blew up and that PASOK have only been in power for 3 months? Typical bloody Tories!